Valentine’s Day may be long past, but if you’ve a penchant for pink you’ll love this little cafe and shop in Poland designed by mode:lina architecture studio. 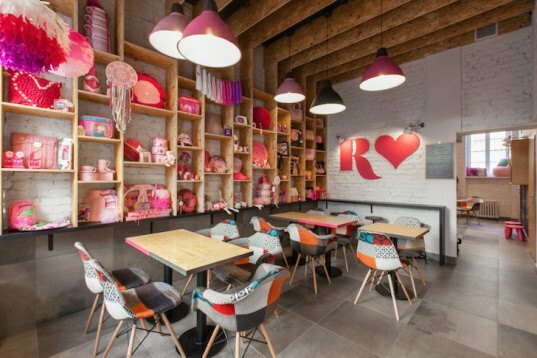 Nicknamed the “Pinkest Shop and Cafe in Poznan,” the Rozove Café is committed to only selling pink items. What caught our eye however, was the architects’ creative use of modular moveable furniture and plywood shelves and ceiling elements to maximize the store’s small 45-square-meter footprint. The client wanted a space that would evoke a cozy and welcoming home-like environment. Thus mode:lina swapped the typical cafe counter with a moveable kitchen island located at the center of the space. The kitchen is also completely on view to customers, as well as the open and fully stocked kitchen shelves. The architects retained some of the building’s original brick wall, but painted it white to brighten the space. The kitchen splash back covers up the brick pattern with white ceramic herringbone tiles. Plywood and MFP boards were used for shelving and extend up onto the ceilings like rafters, connecting the shelving units on opposite sides of the store. Large windows and a glass door flood the interior with natural light. The client wanted a space that would evoke a cozy and welcoming home-like environment. Thus mode:lina swapped the typical cafe counter with a moveable kitchen island located at the center of the space. The kitchen is also completely on view to customers, as well as the open and fully stocked kitchen shelves. The architects retained some of the building’s original brick wall, but painted it white to brighten the space. The kitchen splash back covers up the brick pattern with white ceramic herringbone tiles. Plywood and MFP boards were used for shelving and extend up onto the ceilings like rafters, connecting the shelving units on opposite sides of the store. Large windows and a glass door flood the interior with natural light.